Comments Off on The Dilemma Zone. Click here to leave a comment. I enjoyed this chirpy, odd Finnish world (look at those narrow residential streets!) inhabited by crash test dummies. The earlier posting on late merging reminds reader Joel of the issue of “lane splitting,” by which motorcyclists (and sometimes bicyclists) ride in the space between cars, ideally in heavy traffic. This is legal in California and other states, but, as he points out, it seems to raise drivers’ hackles (in places like Rome, of course, it’s an everyday fact of life, as scooters by the dozens “filter” between cars to settle near the front of stopped queues at traffic lights). It’s an interesting, much-discussed issue (see here or here for example) because it raises so many of the issues that come up in traffic: Social justice (hey, why are they allowed to move when I’m stuck in traffic), different modes sharing the same road space, trading off risks, not to mention cognitive psychology. Like so many things in traffic, it’s complex. In theory, I like the idea — why shouldn’t we use as much road space as possible? (the extra lane space put in for safety at high speeds is essentially wasted during congestion). A motorcycle between streams of cars shortens the length of the queue for cars, after all (and unlike HOV or hybrid lanes, doesn’t reduce existing highway space). On the other hand, there have been times when I’ve been absolutely startled by a motorcyclist unexpectedly passing me. This raises the question of the “attentional set”: If we don’t usually expect motorcycles to be there, will we not see them as we change lanes, or if we unintentionally “drift” a bit? (for the biker, the added problem is the people who don’t signal before changing). As far as I know, the “Hurt Report” has never been duplicated in size or scope, even as more motorcyclists have hit the road. The author himself seemed to think its 1970s-era findings, however, still hold valid. In the U.S., moto-taxis face two main obstacles. The first is insurance. When EagleRider, now the largest motorcycle-rental company, initially shopped for insurance, their rates were three times what they’re paying now. The second problem is a traffic law in 37 states that bans “splitting”—the practice of riding between lanes. Sounds unsafe, but even when allowed, it accounts for only 3 percent of motorcycle fatalities. When it’s outlawed, you’re stuck in crosstown traffic just like everyone else, only you’re breathing exhaust. The 3% number is interesting; then again, if lane-splitting was only done when it is supposed to be, during slow or stopped heavy traffic, I wouldn’t expect large numbers of fatalities. And just to muddy the waters, speaking of social justice and road sharing, I’ve been annoyed lately to see motorized scooters chugging along in the bike lanes in Brooklyn and elsewhere. My knee-jerk reaction is ‘that’s not what their for” and ‘I don’t want your exhaust in my face’; but maybe I’m too harsh — perhaps if it’s otherwise unoccupied it’d be OK. But while it may make them feel safer, they may only be raising their exposure to “dooring” and other hazards. Comments Off on Lane Splitting. Click here to leave a comment. Sometimes I weep for my country, I really do. A motorist caused traffic chaos at one of Telford Shopping Centre’s busiest car parks today when she launched a protest against paying – by blocking off the exits. The motorist trapped cars in the centre’s Red Oak car park at lunchtime by parking her 4×4 vehicle across the exit barriers. Eyewitnesses said she was “raving” and “shouting” about having to pay for the time she had parked in the town centre car park. Drivers stuck in the jams caused by the woman’s protest said she seemed to be a tourist visiting from America and claimed they did not have parking charges in her country. They also don’t drive on the left, let’s hope she didn’t try to protest that. Comments Off on The Ugly American. Click here to leave a comment. 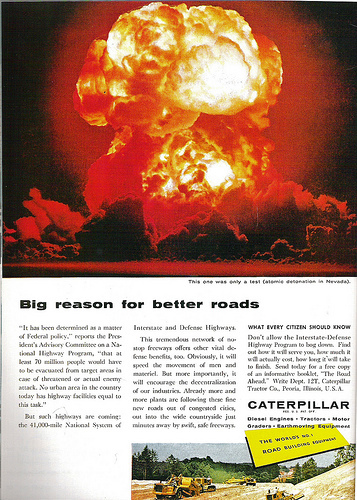 This post combines two of my recent obsessions — the atomic landscape and traffic (not to mention plugging my previous book), and the advertising image shown is typical of the times — playing on deep nuclear paranoia to help push a corporate agenda. There’s an academic article, if not already done, to be written on the appearance of the mushroom cloud or other intimations of nuclear holocaust in 1950s advertising — I even have one in my collection for a paint company ‘now what should we paint the bedroom, honey? Nuclear winter?’ (no, it doesn’t really say that); in any case a mushroom cloud is no doubt more effective an image for road building than rote statistics about lost productivity. In light of recent evacuation troubles (e.g., Katrina in New Orleans) with anticipated natural disasters, it’s hard to imagine that in a surprise strike on major population centers a nice new ribbon of asphalt would have really meant much to the average citizen. Still, if you were going to hit the road, a “Survival Car” might have come in handy. Comments Off on Atomic Highways. Click here to leave a comment.